This is my first leather garment made by Magnoli's and like everything else he has made before; this jacket is top notch. As the title would suggest the jacket is based off Daniel Craig's jacket from the film. However, rather than make a carbon copy of the jacket I decided to tweek the design a little and make the pockets with a scalloped edge as opposed to straight. I also ended up only going with one zipper across the chest instead of two. I wanted the coat to have a vintage albeit designer look to it. Now onto the coat itself. 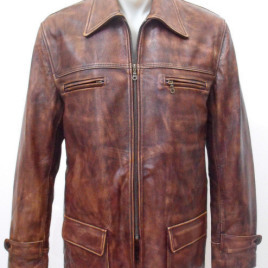 I wanted this jacket to be a serious leather coat, no light weight three season here. This jacket is strictly a winter/cold weather garment, its made from a heavy vegetable tanned cowhide with a predistressed look to it. The lining is a wool plaid material similair to a Burberry check and the sleeves are also lined in a cream colored cotton material. Overall I am VERY pleased with Indy's leather work and when the time/interst arises for another leather jacket project Indy will be at the top of my list. His work is amazing and this jacket is certainly one of my favorites from Indy.